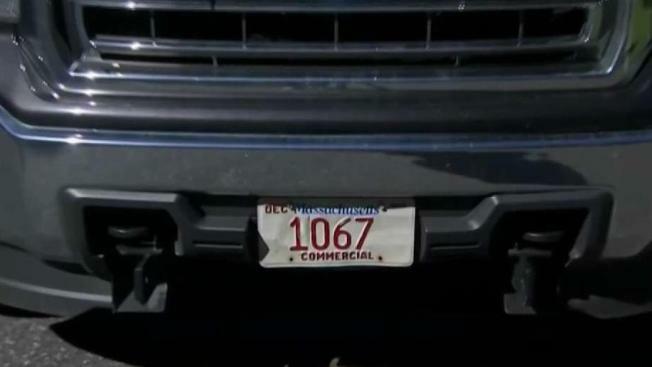 License plate confusion is causing headaches for Massachusetts drivers. Will Reinertson owns a landscaping business and pays extra money every year to secure reserve low-number commercial plates for his company vehicles. However, the Hopkinton business owner recently noticed a bunch of mysterious out-of-state tolls on his E-ZPass account. None of the charges from Maine or New Hampshire made any sense. That’s because his company vehicles never travel out of Massachusetts. Reinertson’s company pickup truck is commercial plate 1067. He figures there is a passenger car with the exact same numbers, and the toll locations are getting the two vehicles confused. “This needs to be corrected. It’s just not right,” he told NBC10 Boston. Cambridge Deputy Fire Chief Michael Morrissey has a “protect and serve” specialty plate on his car. Even though Morrissey has an E-ZPass transponder, he recently received a pay-by-plate bill in the mail for a New Hampshire toll. “There was no way that could be my car. Not at that time and place,” he explained. Because at that time and place, Morrissey was in the midst of a 24-hour shift at work, his Chevy Equinox parked at the fire station all day long. “It concerns me. I don’t want to turn the plate in, but I’m not going to pay tolls when there’s no chance I owe them,” Morrissey said. The two drivers contacted the NBC10 Boston Investigators after spotting previous stories on license plate confusion. The initial report featured a Scituate driver who received hundreds of dollars in mistaken toll violations because her low-number plate had the exact same numeric sequence as a National Guard specialty plate. Other stories poured in on social media as drivers detailed their own experiences with bogus tolls and mistaken tickets. A Nahant driver was even falsely accused of a hit-and-run accident. A Harvard statistics professor questioned why the Registry of Motor Vehicles (RMV) was issuing specialty plates with the same alpha-numeric sequence, demonstrating how there are plenty of possibilities to avoid repeats. After several weeks of attempting to schedule an interview, the NBC10 Boston Investigators attended a MassDOT public meeting to speak with Secretary Stephanie Pollack about the issue. However, following the meeting, staffers quickly ushered her into a nearby room. Agency spokeswoman Jacque Goddard emerged several minutes later to say there would be no interview. She declined to answer any questions about whether the approach was fair to taxpayers. NBC10 Boston then contacted Governor Baker’s office to ask why the transportation agency refused to discuss the issue. Within a day, MassDOT arranged for RMV Registrar Erin Deveney to answer questions. When asked if the state should do anything differently into how plates are issued, Deveney responded that the RMV is in the process of replacing its 30-year-old mainframe system. Once that’s complete about a year from now, Deveney said there will be an option to add more characters and combinations to license plates. “So the state is looking at new and different ways that both technology and process could change,” she said. The registrar also said the agency has tried to balance the requests of customers who become very attached to particular plate types and numbers. She acknowledged that specific alpha-numeric combinations are currently only cross-referenced within particular specialty plate types (e.g. Red Sox), but not the entire system. Deveney added that state workers at MassDOT are in the process of identifying plates that have been caught up in the confusion and flagging those to avoid repeat occurrences.